Our final day in Cornwall was cursed with rain, of course, but we were undeterred and ventured down to St Ives and first, Penzance. The weather was horrendous there, and we couldn’t really find anything free and indoors to entertain us, so we merely stopped at Archie Brown’s before heading off to pastures new. It was quite a mixed bag, actually: it was a nice little cafe, above a well-stocked veggie shop, with lovely fake clouds on the ceiling creating a nice, laidback style. However, the place itself just wasn’t laidback. The service was quite fraught and confused, it took a long time to get our drinks and there were mistakes with our cake order. Maybe it was just a bad day as it was early in the summer holidays. Anyway, it was a vegan friendly place, with soya milk available and a few vegan options on the menu and cakes as well. 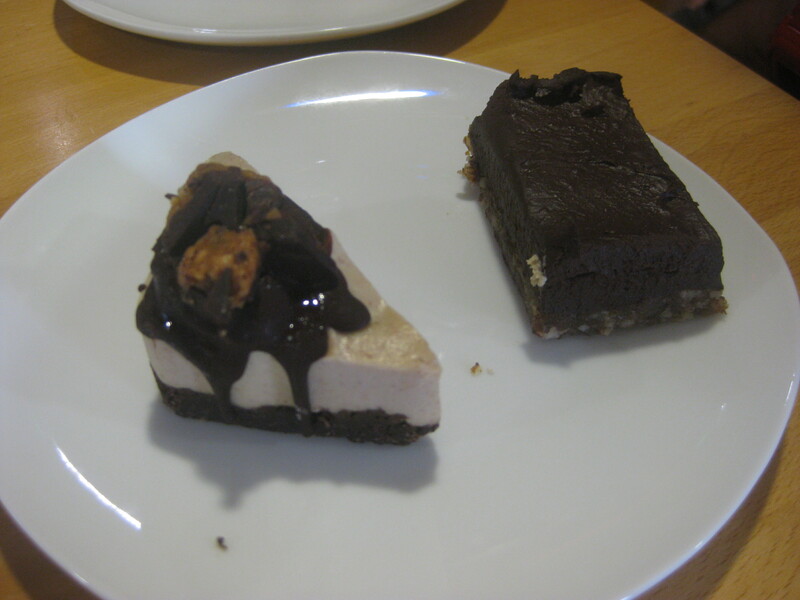 We were tempted by the raw cheesecakes, which were all vegan, and split the chocolate and avocado one and the peanut better and chocolate. The chocolate avocado was a real winner – that’s such a beautiful combination that you can’t really go wrong. The peanut butter one didn’t taste quite as good as it looked, because it was sugar-free and was really lacking a touch of sweetness. These tiny pieces of cake were £3 each, which was very steep. All in all, this place was decent, but I wouldn’t hurry back to it. 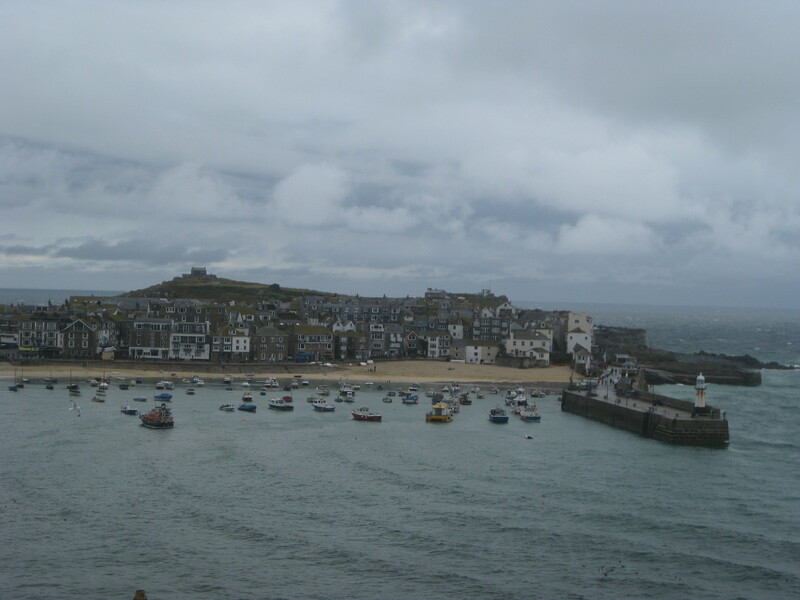 We had better luck in nearby St Ives, in terms of both weather and food. We used the park and ride option and got to enjoy the view from the train (top tip: sit on the right hand side), but were still mightily impressed by the little town when we got there. 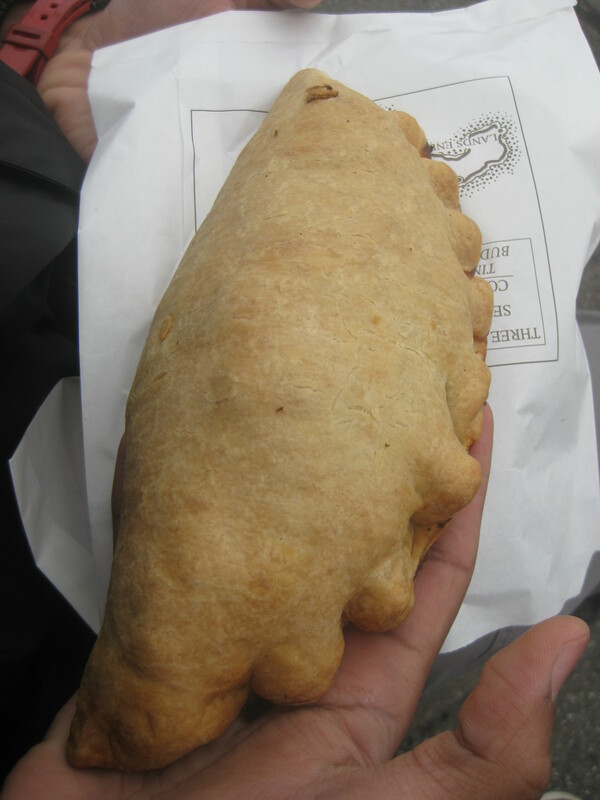 We walked right past Pengenna Pasties on our way to the sea front, so we had to make a quick stop. The vegan pasty is marked on the menu, and I’d read online that the scones were also vegan (the staff confirmed this with a quick look at their list), so we got a couple of those as well. 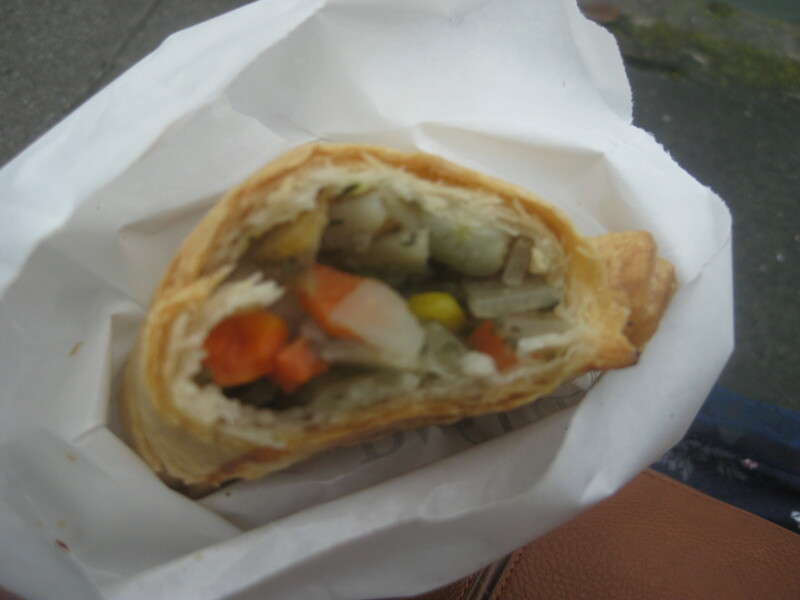 I think the pasty was probably a bit better than the one from King’s Pipe: again it was very big and tasty, crammed with onion, carrot, potato, sweetcorn and beans. 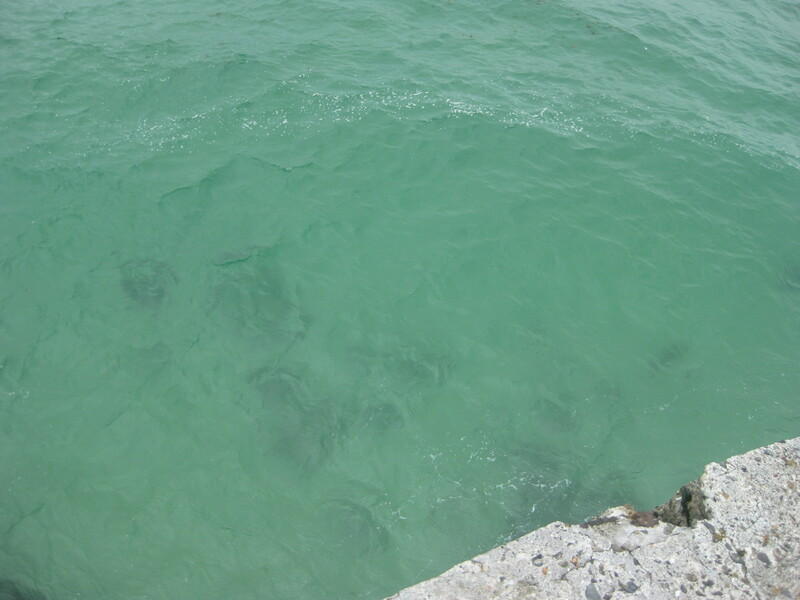 It was good and warming eaten by the sea. We didn’t have the scones until we were back in Manchester two days later, but they were still delicious. We had the plain ones (the raisin ones are also vegan), and they were nice and sweet, and very generously sized. And you can get a bonus glimpse of the exciting new crockery I bought in Polgooth the day before. The set on the left is from the 1880s! Our main eating for the day was done in Spinacio’s (UPDATE: closed in 2016), which is right on the harbour front and on the first floor, so ask for a window seat and you’ll enjoy some stunning views. 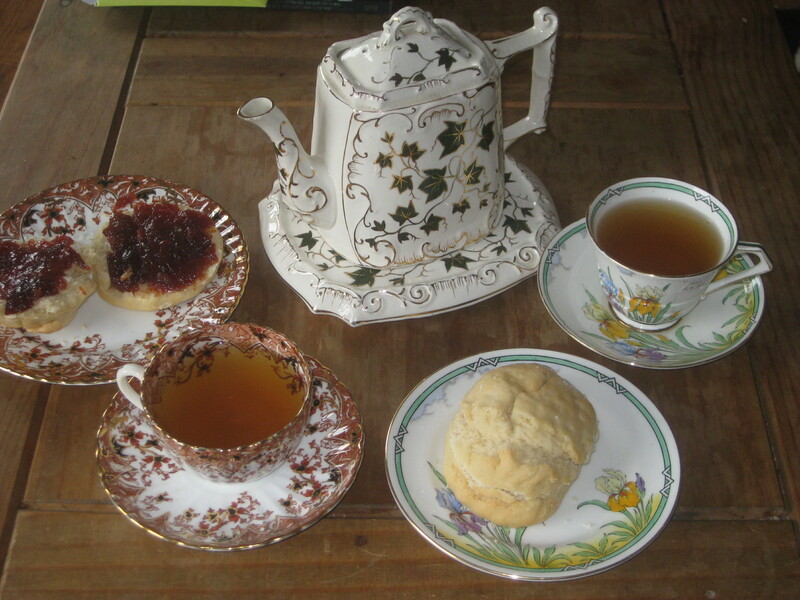 It was a pretty, calm, friendly place with good relaxed service, and I really loved it. The websites only had sample menus, so you don’t get to see the real one until you’re in and looking at the big menu board. For my main course I had black eyed bean pancakes with a creamy kale and coconut sauce – there was a nice amount of spice in there, and the creaminess worked really well with it. 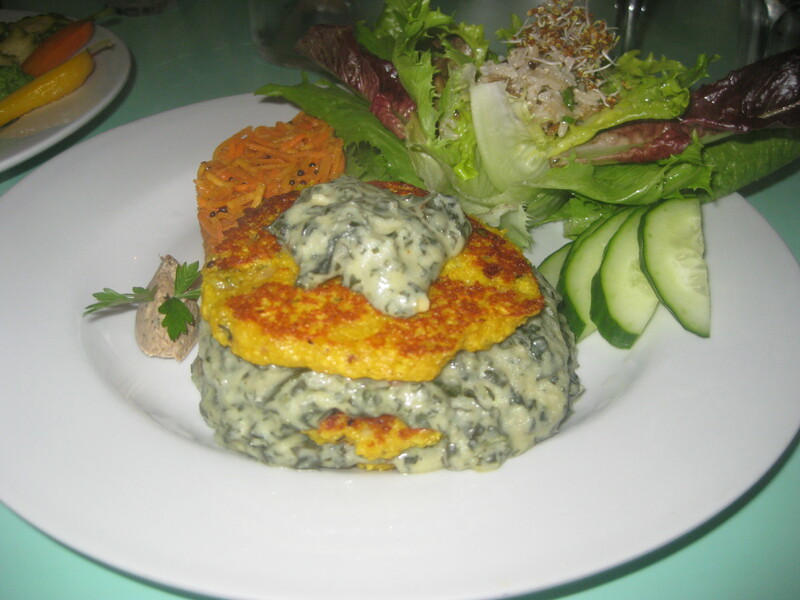 There was a zingy, refreshing carrot and lime salad on the plate as well as another salad, which was nicely dressed but perhaps a bit too big. 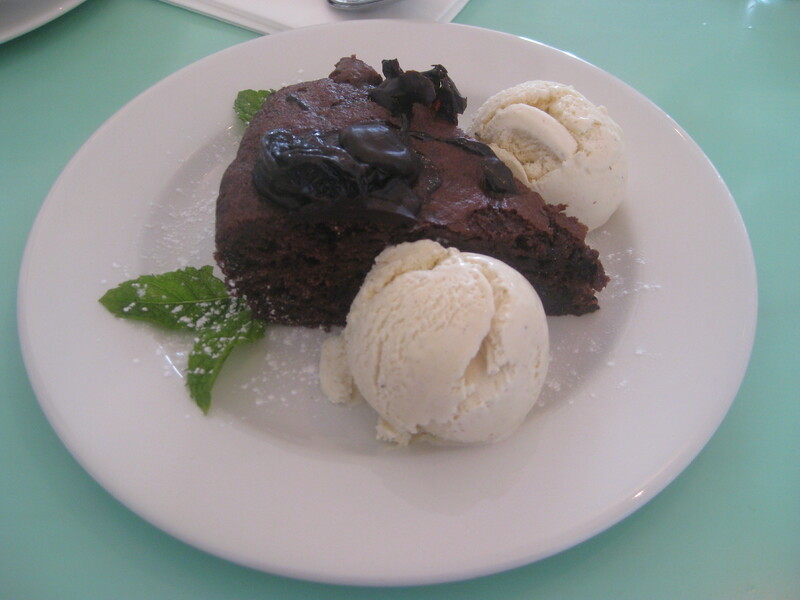 For pudding, I had the chocolate prune cake, which came with not one but two scoops of ice cream. Hurray! The cake was really flavoursome and moist – it was my first chocolate prune cake, but I’m planning on making my own as it was so impressive. That was a fine end to our Cornish dining. I’d been a little worried about it, as Happy Cow isn’t exactly overflowing with options, but we actually ate really well. Wildebeest remained the highlight for me, and also for Mr HH (he had non-vegan dishes in Spinacio’s, but preferred Wildebeest overall). And Cornwall is just so beautiful! 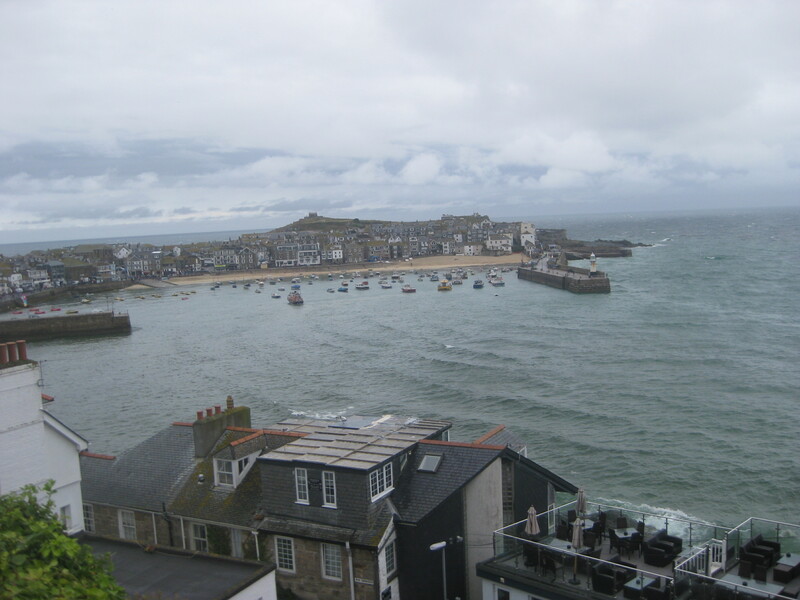 It felt almost like Europe as it was so beautiful – even when the weather was bad in St Ives, the sea was still the most gorgeous colour. I hope it won’t be 14 years until my next trip to the beautiful south! This entry was posted in Travel and tagged Archie Brown's Penzance, Pengenna pasties vegan, Spinacio's St Ives, vegan Cornwall, vegan travel. Bookmark the permalink. I love St Ives! Such a nice place. I went in the winter though, so a lot of places were shut. I do remember enjoying that pasty though! Also, your crockery is great! It was one of those places that is even nice in the rain. Thanks, I’ve just left my crockery collection in storage for a year, I’m gutted!